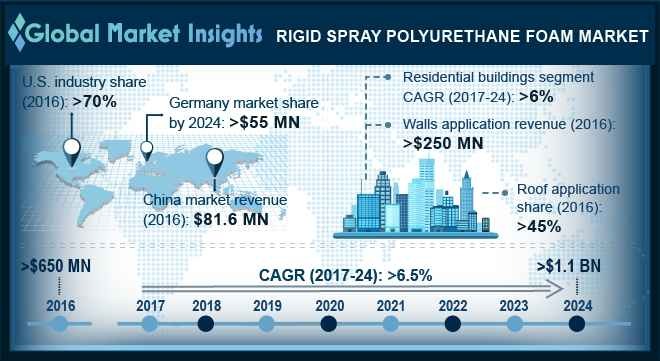 Rigid Spray Polyurethane Foam Market size will surpass USD 1.1 billion by 2024; according to a new research report by Global Market Insights, Inc. Depleting non-renewable energy resources and extensive use of fossil fuels have resulted in an energy crisis. This has become a major cause of concern among countries across the globe and has led to the growing demand for energy-efficient and green residential and commercial buildings. Rigid SPFs are used to cover cracks, gaps, and holes in walls & ceiling and also insulate structures, reducing the energy loss. The foams also help in avoiding any soil or air pollutants from entering the structure, thereby maintaining a healthy environment in the structure. Therefore, SPFs have a higher acceptance over the traditional glass fibers due to several benefits including higher efficiency and ease-of-installation. Along with new construction sites, these regulations have boosted the growth of the rigid spray polyurethane foam market in the renovation of old residential and commercial buildings throughout the forecast spell. Raw materials such as methylene diphenyl diisocyanate (MDI) and tolylene diisocyanate (TDI), used to produce rigid spray polyurethane foam, may cause severe health risks including skin problem and asthma. Although spray polyurethane foam does not cause any health hazards after installation, occupational-related health hazards have become a major concern. These raw materials are isocyanates which are considered as reactive chemicals and prolonged exposure to isocyanates may cause skin, eye, lung irritation, and other respiratory issues. Increasing awareness about health hazards has led to the growth in demand for bio-based rigid spray polyurethane foam market. This will be one of the key restraining factors for isocyanates-based SPF market in coming years. Rigid spray polyurethane foam market is divided based on end-use, application and region. On the basis of end-use, the industry is divided into agricultural, commercial, institutional, residential, and industrial buildings. In terms of revenue, agricultural buildings will account for over USD 45 million in 2024 growing at substantial rate throughout the forecast spell owing to extensive product usage in insulation, water/moisture & thermal resistance on the floor, walls, ceilings and roof, decks of vegetable & fruits refrigeration warehouses, and cold storages. Significant agricultural activities and positive trend towards the cool storage of food products in Asia Countries such as India, China and Japan will further augment the rigid spray polyurethane foam market demand by 2024. Based on application, the rigid spray polyurethane foam market is divided into roof, wall, floor and others. In terms of revenue, floor application is likely to generate over USD 30 million in coming years. The other applications include ceilings, plumbing systems, doors, etc. and held less than 10% share of the global rigid SPF market in 2024. Germany rigid SPF market will likely generate over USD 55 million in forecast spell owing to the positive growth in the residential and industrial building construction activities. The product is used as an insulating and protecting agent on the building floor, roofs and walls. This in turn, will propel the regional rigid spray polyurethane foam market over the forecast timeframe. Some of the industry participants include Mitex International, Foam Supplies, BASF, NCFI, Demilec, Rhino Linings, Dow Chemical, Henry Company and others.